Could a computer one day take on and beat the best poker players in the world? That's the goal of one company that has scooped a top award at the recent GiGse technology conference in San Francisco. Neo Poker Lab has already enjoyed some success with Artificial Intelligence in limit poker and is now turning its attention towards the no limit game. The company's team of 30 physicists, mathematicians and software developers hopes in the long term to create Artificial Intelligence agents that can compete at the championship level. As part of the goal, Neo Poker Lab has launched an updated version of its Neo Poker Bot mobile poker. The app uses advanced Artificial intelligence to play poker at what CEO and founder Rob Gallo describes as 'a very high level'. 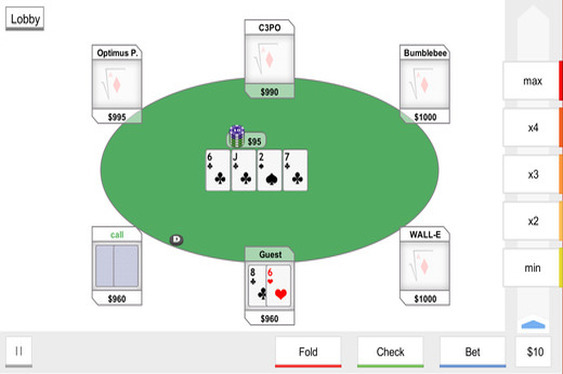 The software also has something to offer the regular poker player as well as the university boffin. "It's a cross between Zunga Poker and Candy Crush, with a generous helping of Lumosity" said Rob Gallo. "Meaning, an entertaining way to play poker in a single player environment and learn how to hone your skills based on your personal style of play." The app impressed the judges at the recent GiGse gaming technology conference where Neo Poker Lab collected the Start-Up Launchpad 2014 award. If you want to take it for a spin, just search for NeoPokerBot in the iTunes store.